After a week out-of-town for work, I was excited to get out to the house today. Christine and I packed up our cleaning supplies and the boys and headed out to the job site. Upon arrival I opened the creaky front door to find my brother was busy picking tape off the floor where the painters had masked everything. Tony was patiently installing all the interior door knobs. We took a quick around and then went upstairs to start cleaning up. The carpet we picked out for the second floor was ultra soft underfoot. It’s green sage color looked really nice and appropriate for the house’s decor. All over there were new things to discover, as much work transpired in my absence. Christine set about getting every penny out our Dyson vacuum, as she swept up all the fuzzy carpet pieces that resulted from the carpet installation earlier in the week. The house is now kid friendly. Both boys had a blast running around upstairs getting in our way. My first order of business was to clean up the windows. I used a flat head screwdriver to push in the expansion pipes behind the flexible window trim. You may remember back when the window were installed, I crimped and hit the ends of the pipes with some clear silicone. The pipes did have a foil balloon attached so that the argon gas inside could expand as the windows traveled over the Rockies….the balloons gave the gas a place to expand into thus keeping the windows from exploding. Pushing in the wire looking pipes into the trim was tedious and some windows were better than others. Once behind the trim I employed a razor blade to scrape off all the paint overspray and window stickers. A wipe down with Windex and a rag finished that task. I forget how many windows we have but I got ’em all clean upstairs and can finish the rest tomorrow. The impressive window wall in our studios required the use of a really cool A-frame ladder that the painters had left on site. I need to get something like that once we move in. Worked really well for cleaning otherwise unapproachable windows. Sweeping the new carpet has to be one of the most rewarding jobs during the whole project. Christine is keeping most of the house cleaning duties to herself as she finds great pleasure and ownership in the various tasks. We did switch halfway through and I swept up the stairs. The staircase is incredibly nice. The guys at Carpet Warehouse did a great job wrapping each tread individually with a 2′ wide swath of the green carpet that was used upstairs. A lot of the remainders were able to be used which kept the material out of the landfill. It’s a nice combination: the carpet, maple treads and the white railing. The white support trim piece under each tread provided the perfect start / stop spot for the carpet wrapping the treads. I really like the wood flooring on the landings too. Having landings afford us the opportunity to place additional art or furniture pieces on site, regardless of the square footage of the landings. One unfortunate omission is a light on our lower landing thus making it a bit dark. Our youngest enjoyed practicing his stair crawling techniques on his new treads; even scooted down backwards a few steps for the first time. We’ll sweep the master suite tomorrow. It’s brown shaggy carpet felt wonderful walking across it as well. Way up top in the attic there’s a light brown “berber” type flat carpet with a subtle dimensional grid pattern. James had a fantastic time running around in circles and jumping off of window sills. The attic will be great for writing, reading, and stormy summer camp outs with the boys. We had a tour earlier in the week. Our architect brought out his second year architecture class to see the place. I wish I could have joined them, as I always enjoy showing off Joe’s latest masterpiece. The report I got back was that the students liked the house and said the attic is “sick”, which I believe is a good thing. Al, our Italian (I think he’s Italian) mason, whom I can barely understand, stopped out. I asked him to mortar some of the stone fireplace crevices in an effort to better camouflage the fact our stone is fake cultured stone. I don’t know Al well but he used to work on our jobs decades ago when my brothers built houses, and I was a good old-fashioned rough carpenter. Was good to see him again. I hope that he can do the exterior stone on the house, once we have the funds to make that happen. He’s a good guy and pretty much the best mason you’ll find this side of the Atlantic. I’ll leave you with today’s pics and their commentary. 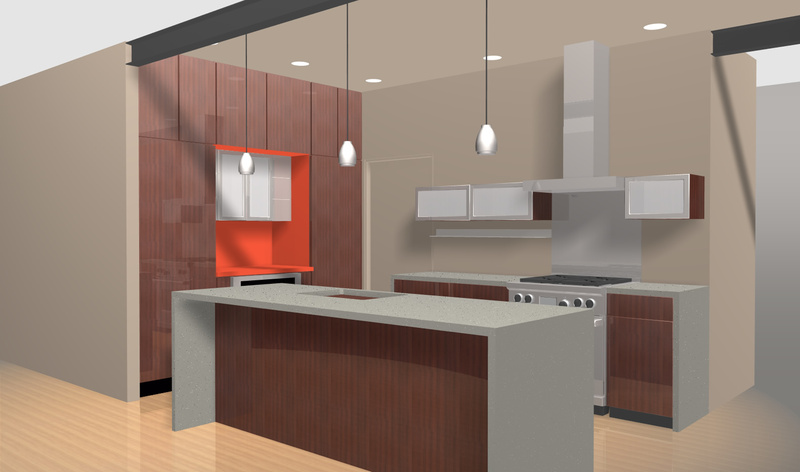 Crazy, but this is starting to look pretty similar to my rendering of the kitchen. Sub Zero integrated fridge and freezer received their skins this week. In the center is our altar to coffee. The big thing on the floor in the middle is our convection microwave awaiting its day in the sun. I'm not sure if it's the picture but I'm pretty sure the lights don't line up on the wall like they are supposed to. Attention to detail is not the construction industry's stong suit. Glass tile is laid and grouted in the master shower. The tiles vary in size so there is some inconsistency. Also note, if you're doing this yourself, make sure you get good mortar coverage. The tile edges are glass which means you can see the change in light penetration where there isn't any mortar in the corners. Overall the shower looks good. Ladders and saws are replaced with carpet and vacuum cleaners. Note the pharmacy sconce in the background from Restoration Hardware. I'll need to remount using longer screws or install some blocking, they're a bit shaky. Boys bath cabinet by Kraftmaid, from Lowes. It's so tight, the door on the right doesn't work. Crappy design and a tight fit = compromise. We picked out these sinks 8 months ago because that's what we "had to do". Turns out they don't fit the cabinet we picked out 2 months ago. Which is a damn shame cause I like the circle shape of them. There's probably a "restocking fee" so we'll just hold onto them and pick up two new ones at Home Depot. unfortunately "compromise" is very common when building a house, even if you think you have full control. I need a giant ladder like this in the future to clean these windows. There's a crank to open top window. Have no idea how that will ever get used. Hall ceiling lights are in. Happiness. Except the electricians need to move one box over staircase to accommodate large diameter lights. Family room is finally clean and ready to go, except for a couple of appliances in the way. Edges of the front door hardware are starting to wear, from oil rubbed bronze to shiny bronze / brass color. Very cool. The handles will help keep time as we, and future generations live in the house. If you're restoring this house 100 years from now, keep these door handles please. Oil rubbed bronze interior knobs are in place. Master closet wall sconces from Restoration Hardware. Kinda industrial, totally cool. Lapa hugger ceiling fan with light from Barn Light Electric. Now that I look at it, they installed it wrong, should be hugging the ceiling with no down rod. They also couldn't install the $75 wall switches I paid for. Two items that we'll get fixed after we move in. Installation issues aside, the fans look awesome in the bedrooms. Cement counter in half bath made by our trim carpenter. It has a fair amount of subtle character that should suit the half bath fairly well. Below is the vanity we got from Home Depot. We painted it black. We'll distress it and add four fake knobs, hopefully something eclectic. This entry was posted in Carpet, Cool Stuff, Design, Electrical, Finish Trim, Sustainable Features and tagged carpet, design, house, interior trim, lighting, stairs by Chris. Bookmark the permalink.